VANCOUVER, CANADA — (November 27, 2018) Moovly Media Inc. (TSX.V: MVY) (OTC: MVVYF) (FRANKFURT: 0PV2) (“Moovly” or the “Company”) is pleased to announce the integration of Moovly Platform with Box (NYSE: BOX), a leading cloud content management platform. This integration makes it even easier for Moovly users to access and upload photo, sound and video content from Box for use within the Moovly Studio Editor. 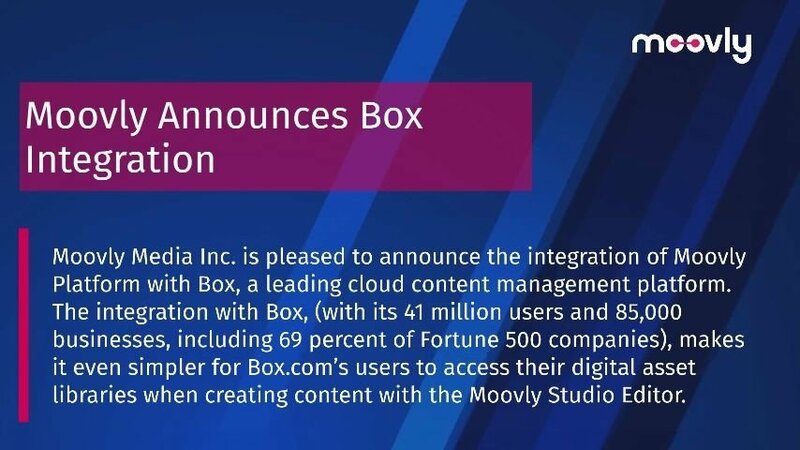 The integration with Box, (with its 41 million users and 85,000 businesses, including 69 percent of Fortune 500 companies), makes it even simpler for Box.com’s users to access their digital asset libraries when creating content with the Moovly Studio Editor. This integration also introduces millions of Box users to the intuitive Moovly Studio Editor, enhancing their video creation experience. For more information on Box, please visit www.box.com.